Get ready for some real excitement, as Akshay Kumar’s “Jumbo” is coming to give competition to Aamir Khan’s “Ghajini” this December. Both the movies are scheduled to be released on the Christmas Day, i.e., December 25th, 2008. While “Ghajini” is an action thriller, “Jumbo” is an animation movie. Akshay and the producers of “Jumbo” feel that their film is great enough to stand against a big commercial and much-awaited movie like “Ghajini”, and this is the reason they didn’t hesitate in releasing in on the same releasing day as day of “Ghajini”. Now, it’s only viewers who will decide the fate of both the movies, as both are coming to give a tough competition to each other. Produced by Percept Picture Company, “Jumbo” is an animated movie that is going to woo both kids as well as parents. It is a movie about a baby elephant called Jumbo who has no connection with his father. This movie gives out a good message to the people and to see that go and watch this movie as it releases soon in theaters. 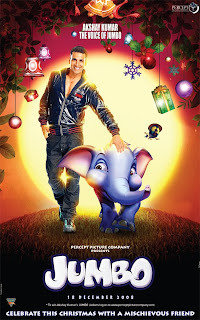 In “Jumbo” Akshay Kumar has voiced for the baby elephant, while Lara Dutta is voicing for the elephant’s crust female elephant. In case, you have missed watching “Roadside Romeo”, don’t miss out watching this upcoming animated movie in December 2008 and also watch out “Ghajini” to compare both.